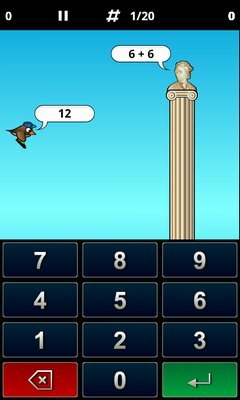 This page provides some school stuff I created to help my son while learning to calculate, train his times tables and other stuff. Hopefully you find something here useful. The content of this page is given freely to public schools and parents as private persons.! It is not allowed to sell or distribute the content provided here on other web sites or on any media. Any commercial use without my written permission is not allowed. If you want to use any content for commercial purposes, e.g. in private schools, for private lessons or in any non-public commercial organization, please contact me beforehand to come to an agreement ! I do not guarantee the correctness of any information presented or given by the content here. If you find any problem, plese inform me. © 2009-2014 Martin Gumhold - distribution is not allowed! 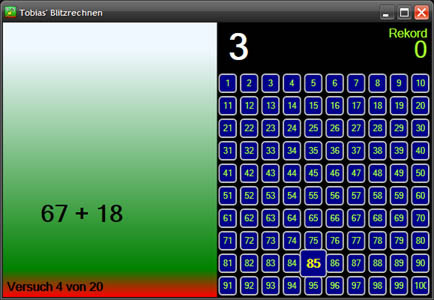 Improved calculation trainer with animation, available in the Google Playstore. 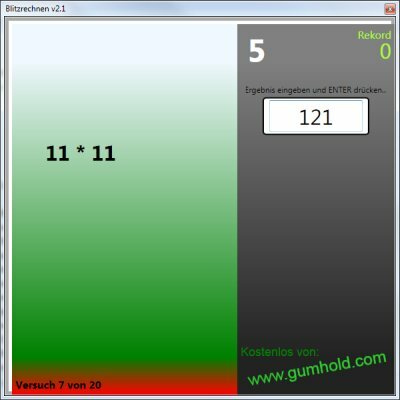 Free version with the Number Range 1-10 and all 4 Basic Arithmetics including Tmes Tables. Full version brings Number Ramges 1-20 and 1-100 and more ways to play. Both versions come without advertising and no In-App-purchases! A program to practice spell-checking. Currently only available for German. Please read the instructions on Installation and Start at the end of this page. UPDATE 13.08.2014: Current version 2.1 stores the results in the program folder! Speed setting in BPM, 2/4, 3/4 and 4/4 beats. Some exercises to practice note values and beats. Type the letters as fast as you can into the computer keyboard. Windows XP / Vista / 7 with dotNET 3.5 or higher. Unzip the file into any folder you want. Double-click the EXE - after you did a virus scan, naturally! The programs try to create a file PROGRAMNAME.dat in their installation folder where the results are logged. © 2009-2014 Martin Gumhold - No distribution of this content here is allowed!